Mobile and tablet devices fuel strong BBC iPlayer growth | What Hi-Fi? 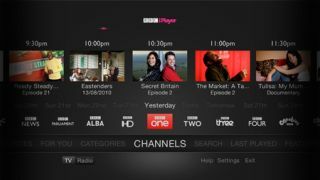 BBC iPlayer saw the total number of requests for radio and TV programmes grow by 24% in the first quarter (Jan-April) of 2012. That amounted to an average of nearly 190 million requests each month, with 140 million for TV shows and 46 million for radio programmes. Mobile and tablet devices continued to deliver substantial growth, with requests in April up 94% compared to the same month in 2011, equating to 15% of the total. Demand from internet connected devices such as smart TVs, Blu-ray players and games consoles also continued to grow, accounting for 11% of all requests in April this year – up 57% on April 2011. Apple also confirmed that the BBC iPlayer app for iPad is the top free app of all time in the UK. And The Voice and The Apprentice were the most requested programmes during the quarter.